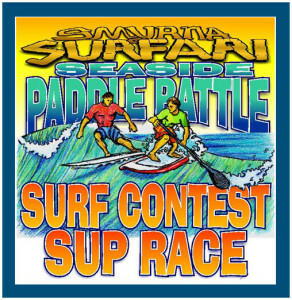 The Surfari Club now hosts two surf contests a year, the Seaside Fiesta event in June, and the Surfari Spooktacular in October. To date, the Club has produced more than 100 contests. 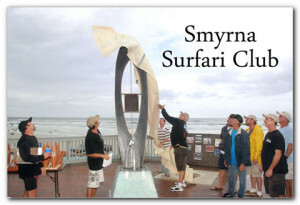 The Club has instituted several features over the years that encourage the participation of the community: The t-­shirt for the Smyrna Surfari Contests are always chosen from designs created by art students from the local High School, with the selected designer being awarded a prize of $100. The Club also donates $100 to the High School’s art department to cover any costs associated with this project. The highlight of each Halloween Spooktacular event is the hilarious “Costume Surfing” division, entries are free and the winner takes home $100. All entries in our two contests receive a free contest t-­shirt. Our contests also feature a Tadpole event. This event is for tykes 10 years and under who with the help of their parents, are guided into waves on their way to fame. Each competitor gets a t-­shirt, surfing medallion and memories of a life time. Competitors in our events who finish at or near the top of their divisions are awarded trophies. These trophies are unique for each one is handmade by Club members. Each wood trophy is shaped like a surfboard and can be considered a work of art. Over the years many of the competitors have stated that these were their favorite of all the trophies they have won. All the proceeds from these events, as well as the Silent Auction and Surfboard Raffle, go to the annual college scholarships that are awarded to graduating seniors from NSB High School. This year the Surfari Club awarded $8,000 in scholarships to four college-­bound students to use for tuition and supplies. Since 1980 the Club has awarded more than $190,000 in scholarships to more than eighty deserving students. Surfari Beach Clean­Ups: As part of its commitment to the environment, in 2008, the Club adopted its 1st mile of beach (Coconut Palms north to Sapphire Park}, the busiest stretch of beach in town. Several years later the Club adopted a 2nd mile of beach from the jetty south, “The Mecca Mile of Surfing on the East Coast”. By December, 2016, we will have conducted 36 cleanups on a combined 40+ miles of beach collecting over a ton of trash. Since the inception of the Balloon Fest in 2009, the Surfari Club has been an active participant, with as many as twenty members at a time rotating in shifts. Club volunteers help work the gates, coordinate the parking and organize the cleanup. (We love to clean up!) Although most of our projects usually take place on the beach, the Club volunteers agreed that the Balloon Fest is a great outreach to the non­surfing public, as well as a valuable fund­raiser. The Surfari Club was instrumental in the production of the Aloe­Up Cup surf contests in 1988 and 1989, the last internationally rated contests on the East Coast for more than twenty years. 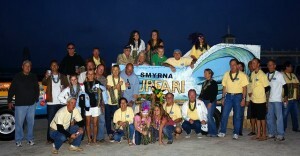 The Surfari Club has a float in the Christmas Parade each December and the Mardi Gras Parade each February. Their very first Christmas float won 1st place in 1983, featuring Joe Burgess as “Surfing Santa” and Stacy Chisolm as the classic, “Surfer Girl”. In May, 2013, the Surfari Club donated $1000 as a co-­sponsor with the City and SVAA to bring Bethany Hamilton, surf star and inspirational speaker, to NSB High School for a speech and showing of her film “Soul Surfer”. April, 2013, the Club added a “Tree in the Park” on Riverside Drive. 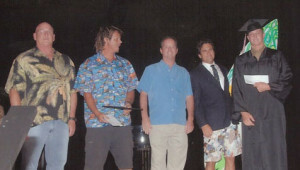 It was dedicated to “The Memory of our fallen Surfaris “ and will eventually have a plaque commemorating those members. 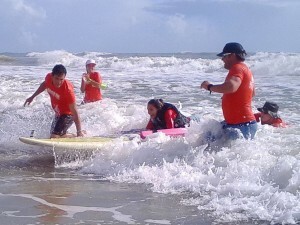 Since the summer of 2014, Club members have lent a hand to the Oceans Of Hope Foundation, assisting physically challenged individuals to experience the thrill of surfing for the first time in their lives. Six brave souls rode three waves each and all left the beach with smiles on their faces. 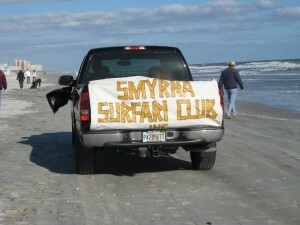 The Foundation now produces up to five events a year with the support of the Smyrna Surfari Club. After 38 years of celebrating the sport of surfing, Club members can be proud of our little Club’s efforts. Our scholarships have encouraged many students to pursue their education beyond high school. Our contests have provided a family oriented competition often featuring some of the best surfers in the country. Our contributions to the community we love have impacted many beyond the surfing world. We thank all of the fine people who have supported the Club over the years. Our success is due in part to the generosity of our sponsors and friends.